Three major anniversaries, over two weekends, all at one monster show, AIR14 certainly had the potential to be a show for the ages. Hosted at Payerne Air Force Base in western Switzerland, the event last took place in 2004 and if that was anything to go by, AIR14 had large crowds and stunning weather to come. Peter Reoch spent a week at Payerne to report for UK Airshow Review. Additional photography from Chris Milne and Andrew Evans. The event dynamics of AIR14 were certainly different to anything we're used to in the UK, both due to the scale of the operation and also the fact the event was last held in 2004. 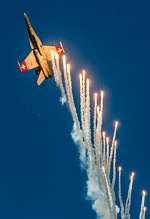 The Swiss Armed Forces still uses conscription system for much of their manpower and indeed much of the military support for the show was done by troops who had been conscripted solely for the event. The show was split over two weekends in an attempt to lessen congestion, with two thirds of the show site remaining open during the week at a reduced entrance cost. 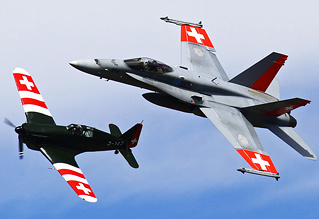 Much of the ground attractions and displays remained the same throughout the nine-day official opening period, with examples of nearly all Swiss Air Force aircraft types present in the static display, with the public areas also containing Swiss Army vehicle displays and a selection of exhibitors from the Swiss aviation industry, showcasing civilian and military aviation career opportunities to the visiting public. During the week, each day had a short flying display featuring mainly the official Swiss display teams that were present, but also contained rehearsals of performers visiting for the second weekend. The flying displays varied greatly across the two weekends, with each day having a unique theme which influenced the displays present. The quality of the flying display content was outstanding, with the each day having around seven hours of performances. Obviously the main focus of the flying displays was on the Swiss Air Force's centenary and all of the official display assets (Patrouille Suisse, PC-7 Team, F/A-18C Hornet solo display & Super Puma solo display) displayed on all four show days. As well as their solo displays, a number of unique mixed formations were performed on across the two weekends including the PC-7 Team formatting on the Hornet / Super Puma on differing days, as well as a joint display from the Patrouille Suisse & PC-7. One formation which will more than likely be unique to AIR14 was a Swiss Air Force F/A-18C Hornet, formatting with Yves Rossy (AKA Jetman) who flew a number of times at the show. The highlight of the daily flying display for many visitors was the 45 minute tribute to the history of the Swiss Air Force, showcasing past and present aircraft in interesting formations and set-pieces. 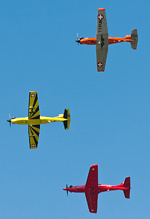 This segment of the show was opened by a paradrop from three Pilatus PC-6 Porters and the playing of the national anthem. 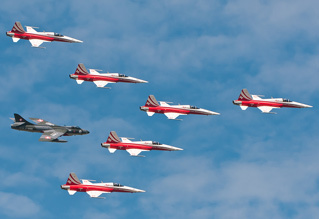 A specially marked F/A-18C Hornet flew a tight formation display with Swiss marked warbirds, alternating between a P-51D & Morane D-3801, in an interesting past/present air defence display. The Hornet also performed an impressive formation display with a Super Puma helicopter, ending with a spectacular flare-dump as the two aircraft broke apart. 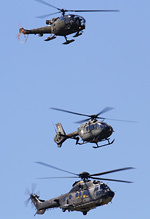 Other segments of the centenary tribute included a mixed helicopter formation featuring examples of the Alouette II, Alouette III, EC-635 & Super Puma as well as two formations of training aircraft: firstly a trio of P-2, P-3 & Jungmann followed by the modern Pilatus PC-7, PC-9 and PC-21. Pilatus also provided solo displays from the PC-9M and PC-21, both of which were extremely spirited and photogenic routines. The highlight of the Swiss tribute section of the programme for most enthusiasts was a superb fourship classic jet formation display, featuring a de Havilland Vampire, Hawker Hunter, F-5F Tiger and Mirage IIIDS. The fourship completed three passes in box-four formation, before completing a run and break and then each aircraft performed a solo fast pass before departing. A brilliantly choreographed routine of four beautiful classic jets, we can only dream someone from the RAF100 committee was watching and taking note..! The biggest aspect of the centenary celebrations was only flown once, as the closing finale of AIR14, with 24 F-5 Tigers completing a flypast spelling out '100' in the blue skies over Payerne. 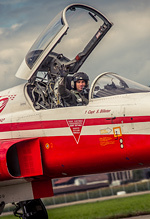 Alongside the daily tribute section, a number of differing role demonstrations were flown by modern Swiss Air Force equipment across the two show weekends. These ranged from a bambi-bucket demonstration from two Super Pumas, to a QRA showcase with two F/A-18C Hornets intercepting a King Air. A past/present display of Swiss Air Force target towing aircraft with a PC-9 and C-3605 Schlepp formation was another interesting set-piece. 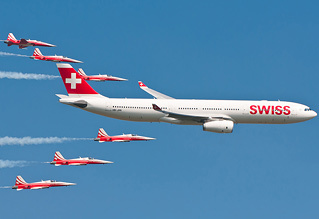 The Patrouille Suisse also performed an impressive display with a SWISS Airbus A330, comprising of flypasts in differing formations before the A330 broke away and missed approach and spirited climbout. Another airliner taking part in the flying display, was the Airbus A380 - which performed the breath-taking solo display. 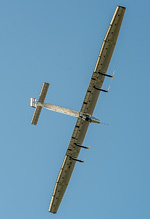 The aircraft flew direct from Toulouse for it's one time appearance, with the display of agility from the huge aircraft putting the Swiss crowd into stunned silence. 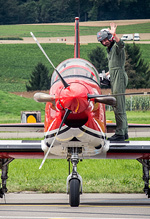 With one of the events key teams being the Patrouille Suisse & PC-7 Team's 50th/25th anniversaries it was no surprise to see a vast number of international display teams performing. Amongst the regular attendees there were a number of lesser seen display teams including the Midnight Hawks, Croatian Wings of Storm and Al Fursan. Thankfully the teams were spread across the two weekends, and most were limited to displaying on only one day to provide variation in the flying display programmes. 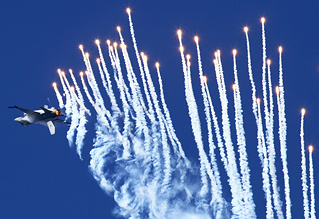 Both the Breitling Jet Team and Breitling Wingwalkers were also present, with the Swiss watchmaker making the most of the massive sponsorship opportunities available with a crowd size of 500,000. Their beautiful Super Constellation also flew a number of times, including in formation (abiet loosely) with the Swiss PC-7 Team. Alongside international display teams, military support for the show was immense with most European fast-jet displays present. One of the rarer items was 'Zeus' - the Hellenic Air Force F-16C solo display. The aircraft was adorned with a new special paint scheme for AIR14, however the weakness of the Greek routine was exposed with both the Belgian & Dutch solo displays present, and the lack of smokewinders and flares compounded the issue. 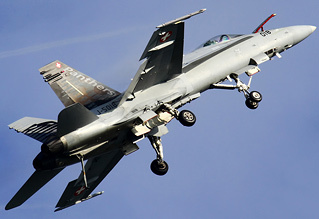 However it must be remember that Zeus is a relative newcomer to the F-16 display environment and therefore we will hopefully see tighter displays in the coming years. 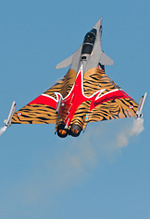 The undoubted champion of the fast jet displays at AIR14 was the French Air Force Rafale solo, which was flown using a Tiger Meet special schemed jet. In recent years the Rafale solo has demonstrated a masterclass in display flying with the perfect balance of raw power and precision flying. The 2014 routine is no different, with the jet constantly infront of the crowd, plenty of reheat and seeming much closer than it's competitors. With such a high standard of fast jet displays, the RAF Typhoon FGR4 display seemed to be tighter and sharper than usual, with the display on Sunday being one of the best displays from the aircraft witnessed in recent years. Other solo fast jets included the Polish Air Force MiG-29 Fulcrum - complete with flares - and the Swedish Air Force Gripen. SAAB were on a marketing mission all week at Payerne, obviously aiming at improving public opinion of the Gripen amid the controversy surrounding the postponed purchase of the type in Switzerland, and alongside the Swedish flying display examples of the fighter from the Czech Republic and Hungary could be seen in the static display, as well as a Gripen NG mock-up. Payerne was also lucky enough to have both of Europe's most popular tactical display teams; Ramex Delta & the Polish Fitter pair. They each displayed on alternative days on the first weekend, both using the same recipe of low, fast and loud to entertain the crowd. While the Polish pair enjoyed perfect blue skies on Saturday, Ramex Delta were not so lucky on Sunday with grey conditions persistent for much of the day, however the moisture did mean plenty of vapour coming from their Mirage 2000N aircraft. As well as Europe's best fast jet displays, visitors to AIR14 were also treated to a vast array of high quality rotary displays. Without a doubt the most energetic display was the Bolkow Bo-105, displayed by Red Bull in a fashion that makes any other helicopter display look pedestrian. Some of the manoeuvres performed during the display were beyond comprehension, a display that has to be witnessed to be believed. Examples of the Mil-24 Hind (Czech), A-129 Mangusta (Italian), EC665 Tigre (French) and A109 (Belgian) were all also present in the flying display showcasing the diverse range of helicopters in use across Europe. Alongside the historic aircraft showcased in the Swiss Air Force tribute there were a significant number of European warbirds on show. 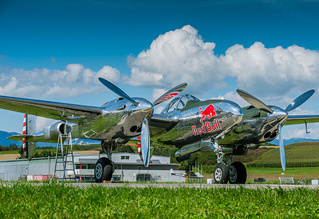 Red Bull's P-38 Lighting, B-25 Mitchell and F4U Corsair displayed on differing days across the two weekends. Other notable warbird displays included a Spitfire pairs display, AD-4N Skyraider and P-51D 'Moonbeam McSwine'. Duxford based B-17G "Sally B" flew an interesting formation with a Swiss Morane D-3801 to re-enact the interception of Allied bombers over Switzerland during the Second World War. A surprise highlight of AIR14 was a one-off formation display from a DC-3 Dakota and two Beech 18, all in polished chrome schemes. They flew a number of passes in different configurations before separating, and each completing short solo routines. Another pleasing formation display was a regular pairing of Hawker Sea Fury & Hawker Hunter complete with smoke generators which flew an elegant display. One of the rarest historic aircraft displayed at AIR14 was the Messerschmitt Me262, operated by the Airbus Group Heritage Flight. The replica aircraft has engines which produce over 50% more power than the originals, and yet the Me262 still looks incredibly underpowered, which begs the question how the type was combat effective in service. Even with an extremely sedate display, it was brilliant to see the Me262 in the air and fingers crossed we'll see her displaying somewhere in the UK soon. As previously mentioned, nearly all types of Swiss Air Force types could be found on the static display throughout the week and on both weekends. 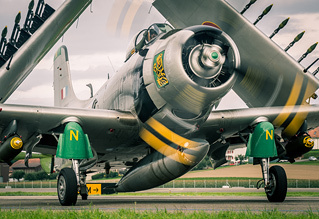 The rest of the static display was extremely dynamic with types such as the Breitling Super Constellation and 'Sally B' moving between the static park and live-side throughout the week. Highlights of the static display included a pair of Royal Canadian Air Force CF-188 Hornets, pair of Portugeese Air Force Alpha Jets, Italian Army NH90, Austrian Typhoon and Croatian Air Force Mil-8 Hip. The welcome return of American military aircraft to airshows continued at AIR14 with a pair of USAFE F-15D Eagles from RAF Lakenheath present on the static display on the second weekend. With such a variety of types on static display it was however a slight disappointment that the barriers were placed so close to the aircraft during the weekend to make photography virtually impossible. Aside from the bumper flying displays and quality filled static, the overall airshow experience at Payerne was brilliant. On the weekends daily crowd figures were around the 100,000 mark but getting in and out of the show was a breeze. Admittedly the walk from the carparks to the showground was longer than most UK events (with the most distance car parks being more than 1.5km from the entrance gates) but at least these eased the traffic issues that would be expected with an event of this size. AIR14 offered two main catering options, one of which being a restaurant/café set up in an aircraft hangar with high quality food at respectable prices. Catering on the rest of the showsite was limited to two options - an "AIR14 Sandwich" or an "AIR14 Vegetation Sandwich" - both of which were handmade, high quality and again at respectable prices. During the lunch-break the queues at catering outlets did grow to significant lengths but with the number of visitors at the show this is understandable. Not once throughout the week did we witness any queues for the toilets - something that is starkly contrasting to the experiences of many at large UK airshows. Value for money is a concept that is discussed frequently on UKAR, and the ticket prices at AIR14 certainly delivered that. When purchased in advance, a weekend ticket for the show was 40CHF (around £25) which for the quality of the show is staggering. Another example of the staggering value AIR14 represented was the official Souvenir Programme, which retailed for 15CHF (around £10) and was extremely high-quality but more importantly came with a free baseball cap which was embroidered with the Breitling & AIR14 logos. AIR14 will probably go down in history as one of the best aviation events in Europe this decade, and for good reason. This becomes clear when you look at the cancellation list for the flying display - which included the Russian Knights, Canadian CF-188 solo display and Slovakian MiG-29 solo display. For most airshows, loss of one of these items would be a staggering blow to the line-up as they are all massive highlights. Yet at AIR14 they weren't even missed, thanks to the number of other quality display items, the flying display was most definitely "all killer, no filler". The Swiss Air Force certainly got the centenary celebrations they deserved, and their 10 years of planning was all worth it. We at UKAR just hope that the 'RAF 100' committee were watching very carefully how the Swiss did it, and that they can pull out all the stops in 2018 to match the quality of AIR14… a "that'll do" mentality must be avoided at all costs.